Try the dentures and dental appliances cleanser for 7 consecutive days free of charge. Limit of one sample per user per year. SPECIFICALLY DESIGNED FOR DENTURES ON IMPLANTS AND SOFT LINER. Effective cleaning solution for all types of dentures and dental appliances such as complete dentures, partial acrylic or metallic*, mouth guard, teeth aligner and mandibular advancement splint. Specifically formulated for deep cleaning of dentures on implants and soft liner. Each sachet produces a specially formulated cleaning solution for use of 7 consecutive days. Let the denture soak in the cleansing and disinfecting solution for 8 hours to deep clean, remove tartar and make it as smooth as new by eliminating any encrusted germs, bacteria or fungi. Then, discard the solution and prepare a new one that will be used for 7 days. Repeat this step if treatment is discontinued for 2 weeks or longer. 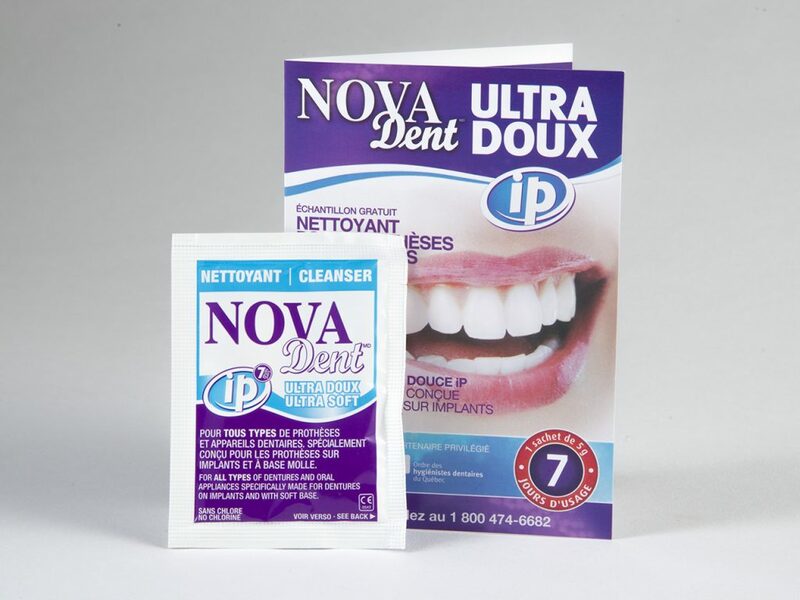 Novadent iP Ultra Soft is specially formulated for dentures on implants and soft liner. EMPTY THE CONTENT OF A SACHET into 3/4 of a cup (185 ml) of lukewarm water (this will help the crystals dissolve more rapidly). The solution is specially formulated to be used for 7 consecutive days. RINSE denture or dental appliance with lukewarm water before soaking to remove any food particles. SOAK denture or dental appliance for a minimum of 15 minutes a day or a full night. RINSE THOROUGHLY with lukewarm water before placing the denture or dental appliance back into mouth. *SAFE FOR METAL PARTIAL DENTURES SUCH AS VITALLIUM, TITANIUM AND COBALT-CHROME. External use only. Keep out of reach of children. Eye contact: Flush eyes with plenty of water for 15 minutes. Ingestion: Do not induce vomiting, call the poison center. Avoid contact with objects containing gold (jewelry, chains, rings, etc. ), with colored fabrics (clothes, towels, etc.) and colored surfaces (vanities, floors). Always keep the outside of the denture bath completely dry. Do not use for dental orthodontic appliances with soldering and any appliances containing gold. © NovaLab. All rights reserved.